Hangboards are a vital piece of equipment for both serious climbers who want to up their climbing game and hiking juveniles who want to become better at the sport. Hangboards, also known as fingerboards, assist climbers in building both their arm and shoulder muscles. These boards are also an essential tool for those climbers who want the ability to quickly and efficiently improve finger strength. Made from materials such as wood, or coated plastic resin, these fingerboards are a good investment. This will benefit those who are serious about training and improving their climbing abilities. In this guide, we’ll take a look at the 5 best hangboards on the market and some of the qualities that place them at the top in the industry. The Metolius Silmulator 3D training Board is definitely one of the most aesthetically pleasing hangboards that landed on our list. This board is made with every single climber imaginable in mind. When designing the board, all skill levels were taken into account which is evident by the width of the board. Wider than most, this board features a large range of holds that span every single level of difficulty. This hangboard is truly made for every level of climber. The Simulator 3D is marketed as a fingerboard for beginners, but is steadily becoming the favorite of more experienced climbers. This is in part due to its wide array of holds and levels of challenges. A huge advantage of the Simulator 3D Board is the fact that this board actually saves you money. This is beneficial as you won’t have to invest in a new board for increasingly difficult skill levels as your climbing ability improves throughout your training. This board is made from a plastic and polyester resin. The resin comes CNC milled. The board is coated with a comfortable gripping texture designed to reduce irritation on the skin. Designed with ergonomics in mind, this board is built with a taper from top to bottom in both directions to allow for better forearm clearance when climbing. The taper combined with the multiple grip options help ease climber’s progression through the holds. Metilous is definitely a leader when it comes to manufacturers of hangboards. Much like the other options on the list, this brand is known for high quality, durable workout gear. Which is why it does not disappoint with its Contact Hangboard. 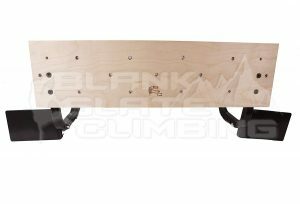 This hangboard is a tad larger than some of the other options on our list, but that space is well utilized as the board provides over nineteen different holding options. This larger board has a wide variety of edge sizes and various depth options offering endless workout potential. With five rows of grip options with increasing levels of difficulty, this board can be used for easier beginner workouts. Additionallly, can be used for more challenging exercises for experienced climbers. The board also features pockets for two, three, and four finger holds in different depth options allowing for a more precise workout. The board does feature a few easy slopers that some of the other boards on the list bypass, but combined with different width pinches, this board will definitely provide a challenging workout. 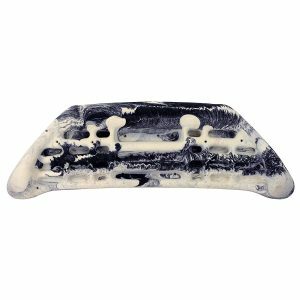 Much like it’s other boards, Metilous designed the Contact Hangboard with ergonomics in mind. The curve and perfect symmetry of the board offers added stability and balance. The texture of this board is also something to note. 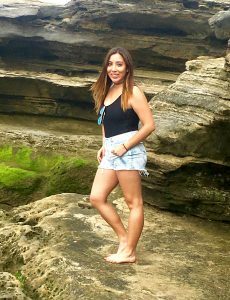 The Contact board was designed to be skin friendly and chafe free so you won’t have to worry about any irritation during your workout. The wide design of the board also helps to prevent fatigue when training. Consistently coming in at the top of climbing enthusiasts’ rankings of top hangboards is the Beastmaker 2000 product. The Beastmaker 2000 is made with serious climbers in mind, hence the name ‘Beastmaker.’ When designing this hangboard, the makers of the product consulted with some of the best climbers in the UK to ensure they crafted one of the best hangboards in the business. The Beastmaker 2000 is made to push your finger strength to the limits and help get you to your higher grip goals. This hangboard comes with a multitude of features including not one, but three different types of slopers: 25 degree, 35 degree and 40 degree. A mouth jug is also included. Along with this, the Beastmaker 2000 comes with multiple finger sockets in both small and medium sizes. As if that wasn’t enough, this hangboard also comes with pockets and rungs to increase the number of training exercises available when using the board. The material this hangboard is made from really sets the Beastmaker 2000 apart from its competition. Made with the environment in mind this board is constructed with completely sustainable wood. This wood is smooth enough to keep your skin intact yet grippy enough to prevent a ton of slippage. The Trango Rock Prodigy Training Center is one of the most unique hangboards to make our list. What really sets this fingerboard apart is right in it’s name. 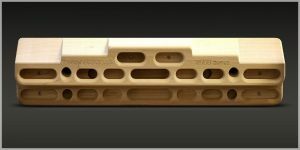 This hangboard is not just a single fingerboard, but it is designed to be an entire training center. A unique feature of this hangboard is it’s ability to split in half. By splitting in half, this hangboard is built to accommodate those who require wider shoulder widths. The downfall to this is a longer time required to mount the hangboard due to the two separate halves. Trango’s Rock Prodigy does offer a wide variety of grips. In fact the training center allows for over fourteen plus hand positions. Some holds on the board are made with offset pockets to allow for many options. The board is also made with edges that change in depth as they move across the board. Marker bumps along the edges help you to stay lined up as you make your way across the board. Made from a high quality plastic material, this training center was constructed with climbers of every skill level in mind. One thing to keep in mind when considering this hangboard is the amount of texture on the grips. Because this board is made of a plastic material, the added texture on the holds can reportedly be a little too much for some climbers’ fingers when training long sessions or right before climbing days. If you’re one of the increasing number of individuals who don’t own, but rent their home, Blank Slate’s Climbing Trainer is the hangboard for you. This board comes with a foam padding to ensure your walls and doors don’t get damaged from use. This wooden hangboard is different than some of the other options on our list as it is designed to be mounted in the doorway without the use of screws limiting the amount of damage to walls from hanging. The hangboard is also designed to hold up to three hundred pounds making it perfect for almost everyone. Another stand out feature of the Blank Slate Climbing Trainer is the addition of a slot perfect for holding your cellphone. This makes it extremely easy to listen to music while getting in your climbing workout or time your workout to increase your skill level. This training board also comes with an adjustable slot mechanism allowing you to adjust the height of the board to fit your workout. The Climbing Trainer comes with everything needs for set up and installation of the board including the foam padding, slot mechanism, a climbing hex tool and a holder. The board also features seventeen different holds to allow many various climbing options. 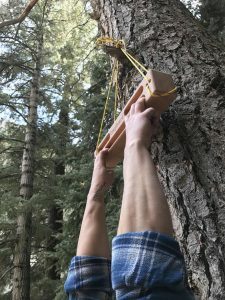 Made from stained and treated birchwood, this high quality hangboard is a great option for those climbers who are looking for a board that provides multiple workout options. 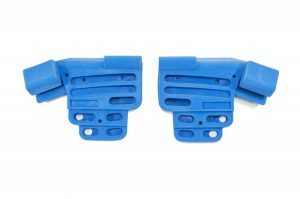 If you’re a serious climber, or someone who just wants to improve their upper body and finger strength, there’s a few things you should take into consideration before purchasing a hangboard. Not all hangboards are made equal. It’s important to pay attention to the material the hangboard is made from when choosing which board is the best fit for you. The most popular materials used to make hangboards are polyester resin, plastic, and various types of wood. There are pros and cons to each type of material. Wood hangboards are typically the most comfortable on your skin However, the low friction of the wood can add an extra level of difficulty. These types of boards are also more limited in the shape options and variety of holds. Wood boards are more lightweight, however which can make them easier to mount than their plastic counterparts. Polyester resin and polyurethane hangboards have very similar qualities. While most holds used to be made from polyester, today more are being constructed with polyurethane because it is more lightweight and less likely to chip when mounting. Both of these materials provide the ability to make unique holds of various shapes and sizes. They also typically have a more grip enabled or texturized surface compared to the wood options. This texture does tend to be harder on your skin, though. 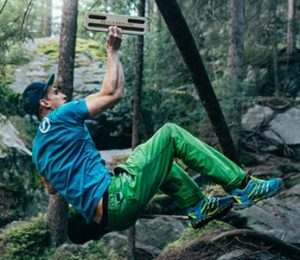 Depending on the how serious of a climber you are, you may want a hangboard with multiple hold options. This may mean a board that features jugs, slopers, pockets, pinches, crimps, and edges that have varying depths and widths. Boards that have a lot of variation in their holds are typically easier for beginners to use and more favorable as a warm up before serious climbers start their actual workout. To improve finger strength, if that’s your goal, it’s best to find a board with holds that progress in size and edges of varying widths. Every hangboard is different. It’s important when weighing your options for hangboards to consider where you are planning on mounting the board. Some boards are made specifically to be mounted in doorways while others may require additional tools or materials in order to securely be mounted to your wall. Many hangboards come with pre-drilled holes and even screws to aide in the ease of the mounting process. Others, however require you to dig out your drills and potentially even purchase an additional board to secure the hangboard to instead of mounting directly on the wall for safety reasons. Some boards, like the Blank Slate Climbing Trainer, come with foam padding making them the best option for those seeking a hangboard that won’t damage walls. This is a great option for those living in a rental property. Hangboards, or fingerboards as they’re also commonly known, are an essential tool for anyone serious about gaining both upper body and finger strength. 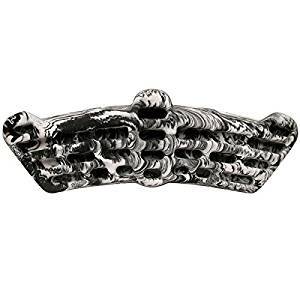 A quality hangboard should have a nice texture that isn’t harsh for your skin and come with a variety of grips, edges, and holds. While our top pick was the Metilous Simulator 3D Training Board, most of the boards on our list are designed with every skill level in mind, so no matter where you are in your training journey, there’s an option for you!